9/1/18 – September 1st, it’s fall ya’ll! Find out what our members and chapters throughout Wisconsin have been up to this last month. “Stand Up. Be Proud. Get Involved. Recently I spent several days at the Adams County Fair. There are few things in my life that I feel are important enough to spend this kind of time on, and Our Wisconsin Revolution is one of them. While preparing for this booth, I wondered how people would respond to the different types of signs and messages I was trying to portray. Once my booth was set up, it did not take me long to find out. The classic OWR banner laid across the front of the table, accompanied with signs I made describing the beauty Wisconsin. As the photos of Wisconsin caught peoples eyes they lingered, read the other signs and started to talk. I had created signs that reflected why I got involved in Our Wisconsin Revolution. Signs about getting money out of politics, raising the minimum wage, and single payer healthcare. About retiring with dignity and being able to safely drink water from my own well. Signs about the importance of protecting our environment and how much I enjoy watching sunrises, sunsets and even occasionally spotting wildlife while hiking or boating. I realized that I am so lucky to be able to enjoy these things, but I cannot enjoy them without also fighting to preserve and protect them. 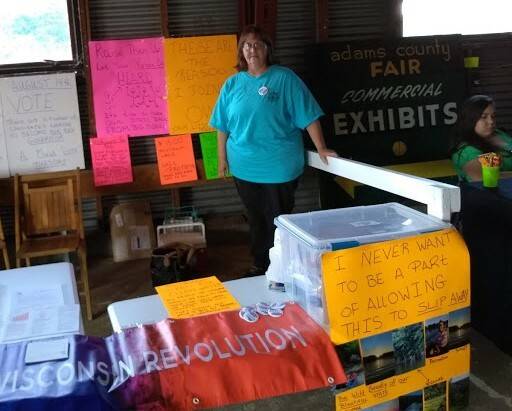 Being a part of OWR, we have the opportunity to share our involvement with our friends, family, and the average Wisconsinite that happens to walk by an OWR booth at the Adam County Fair. We owe it to each other to start the conversation. Being a statewide organization it’s difficult to keep up with the pulse of things happening outside of your chapter. Joining a committee is a great way to stay up to date on issues that you value and meet members from around the state. We have a number of committees that would flourish with more member involvement. Please consider joining any of the committees listed: Communications, Policy & Platform, Political Strategy, Endorsement, Events, Popular Education, Membership, Fundraising and Volunteer Committees. If interested please fill out the committee google form here. “Voter Registration is the most important activity that we can engage in, and while we should be making an effort to increase voter registration every day, National Voter Registration Day is an opportunity to coordinate registration efforts with many other groups across Wisconsin and the nation, hopefully catching the attention of some who may not have registered otherwise. Every OWR Chapter needs to find a way to participate in this campaign if at all possible. Despite the victories, we will not win in November without an increase in eligible voter participation. The talk of a “Blue Wave”, while encouraging and comforting to some, has created complacency in far too many areas. We cannot depend on our recent successes, or the failings of those who oppose our Platform, to propel our endorsed candidates to victory. Polls, Celebrity Endorsements, campaign slogans and amusing tweets are no substitute for or guarantee of VOTES. More eligible voters have been purged from the roles in Wisconsin than the number of voters who cast ballots for Progressives in the August Primary. Adams County Fair (8/9-8/12)- Members of OWR-Sauk County attended and tabled at the Sauk County Fair. People’s Picnic (8/29)- OWR Dane County along with many other local organizations sponsored the 2nd Annual People’s Picnic on Sunday, July 29th from 4:00 pm to 8:00 pm in Brittingham Park. The day was filled with speakers, tabling, games, and good food! DNC Meeting in Chicago (8/25)- In a historic move the Democratic National Committee voted to limit the power of superdelegates in the first vote during the presidential nomination process. Members of Our Wisconsin Revolution joined members from Our Revolution-Illinois in Chicago to hold DNC members accountable. Watch the video of Our Revolution activists and Our Revolution president, Nina Turner, giving a recap of events HERE. 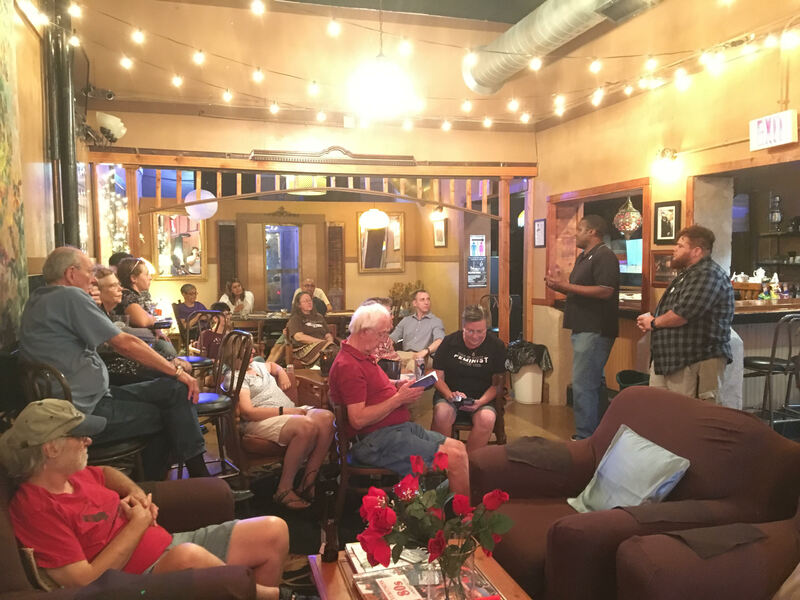 Janesville Mixer (8/25)- In an effort to get anOWR chapter started in Rock County, CD1 Board Members, Esther Roberts, and Krish Colon, have been planning mixers throughout the first Congressional District. The Janesville Mixer brought members from progressive organizations in the area together for good food, drink, and conversation. Milwaukee Mixer (8/29)- OWR-Milwaukee co-hosted a community mixer with the Milwaukee area Democratic Socialist of America at Barnacle Buds in Bayview. La Crosse Open Streets(9/2)- The streets of La Crosse will be open for bikes, roller skates, strollers, families, and fun! OWR- La Crosse will be there promoting voter registration. Check out the Facebook event. Labor Fest (9/3)- Dane County OWR will be tabling at LaborFest ‘18 in Madison, WI. This is a free event, open to the public. Learn more HERE. RISE UP: Peoples Climate March (9/8)- In Milwaukee and up in the Northwoods we’ll be marching for a transition to 100% clean renewable energy and investments in good, clean jobs. We are confronting our climate crisis not only as an environmental issue, but also as an issue of social and economic justice. No more stalling, no more delays: it’s time for a fast and fair transition to 100% renewable energy for all. RSVP for the Milwaukee event or RSVP for the Northwoods/Minocqua event! Wisconsin’s Choice Evers/Barnes Forum (9/12)- Wisconsin’s Choice will be hosting a forum with Democratic Governor and Lt. Governor Candidates Tony Evers and Mandela Barnes in Milwaukee, WI. This Forum will give OWR members and Wisconsin’s Choice participants the opportunity to get to know these candidates better and ask questions. Fighting Bob Fest (9/14-9/17)- Our Wisconsin Revolution has again signed on to co-host Fighting Bob Fest along the with Progressive Magazine. Saturday 9/15 – La Crosse is hosting a day filled with speakers, trainings, music, and food. RSVP to receive updates for this event. Monday 9/17 –Milwaukee is hosting a one-man show written and performed by Josh Fox, Our Revolution-Creative Director. Tickets are being sold for $15 on their Eventbrite page. Eau Claire Grassroots Festival and Summit (9/22-9/23)– The Wisconsin Grassroots Network is hosting a grassroots festival and summit in Eau Claire, WI. For more details visit their Facebook page. The cannabis legalization advisory referendum was introduced in 21 counties in Wisconsin. While 5 counties (Fond Du Lac, Outagamie, St. Croix, Walworth, and Winnebago) rejected the referendum, 16 counties passed the referendum (Brown, Clark, Dane, Eau Claire, Forest, Kenosha, La Crosse, Langlade, Lincoln, Marathon, Marquette, Milwaukee, Portage, Racine, Rock and Sauk) meaning this referendum will be on the November ballot for over half of Wisconsin’s Population. 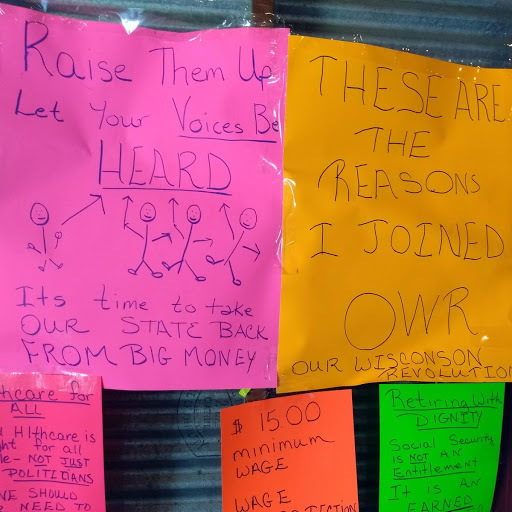 Our Wisconsin Revolution members from all over the state took time to introduce this referendum, show up at local county board meetings, call their supervisors and tell their stories. With 61 percent of Wisconsinites favoring cannabis legalization, this referendum could push turnout numbers for the November election. Read more about the referendum questions that will be on the ballots in each county HERE. “Thanks to everyone who worked tireless hours supporting candidates before the August 14th Primary. And a special shout-out to Sarah Godlewski who was elected with 40% of the vote for State Treasurer. Congratulations are in order for Tony Evers & Mandela Barnes; it feels great to know who is at the top of the ticket and I am excited about Wisconsin’s Choice & Our Wisconsin Revolution joining forces to get out the vote. I know many of you are eager to hit the pavement & phones in support of endorsed candidates locally before November. We prioritized endorsing candidates in chapters who are out knocking doors and making calls in support, or who have been active in OWR. Moving forward, we will focus on endorsing more candidates and encouraging Our Revolution nationally to endorse as well. These candidates are teachers, veterans, parents and small business owners who have been propelled to run for office and fight for a better Wisconsin. Every OWR endorsed candidate agrees with the vast majority of our platform and if elected will work to implement our platform goals.